So the hard part’s out of the way; after much turmoil you’ve finally perfected your travel wardrobe and created a chic capsule collection – now it’s time to get packing! Which luggage accessories and packing organizers will work best for you? 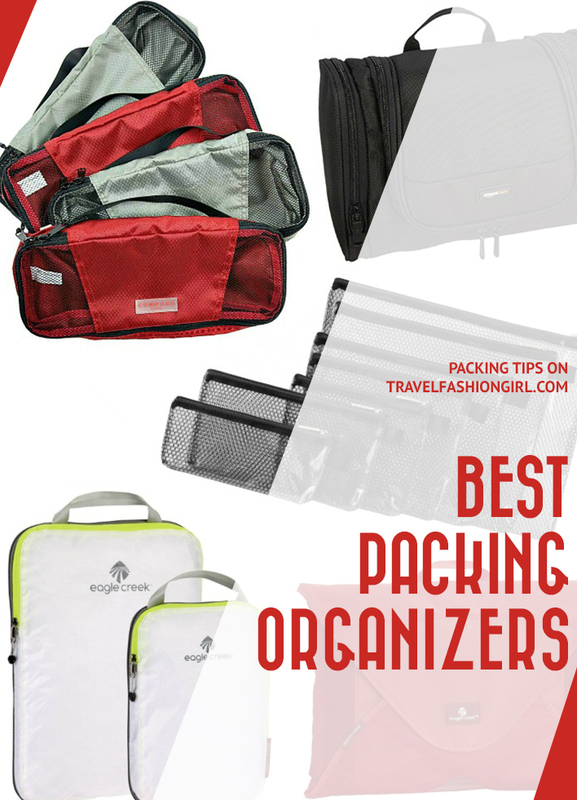 Packing organizers have risen in popularity over the past years, with many traveling folk unable to imagine packing for a trip without them, (TFG included!). They allow optimum use of the space in your luggage, keeping everything organized and in place during your travels, and making the task of unpacking and re-packing your travel capsule wardrobe simple and stress-free. The following guide looks through the top packing organizer types, allowing you to choose the ideal style for your personal travel itinerary. Here, we’ll explore all of them in more detail. The packing cubes come in two different sizes: slim and regular. Slim packing cubes like the Compass Rose featured above can be packed next to each other, perfect for carry-on luggage, backpacks, and travel duffels. The regular cubes are large square shapes, ideal for a regular size or large suitcase. Every traveler’s favorite luggage accessory is the packing cube! Coming in a wide variety of sizes and colors, travel packing cubes are mesh and fabric containers that organize your luggage allowing you to pack efficiently. Follow this video tutorial to learn how to pack your belongings using packing cubes and save valuable space (think souvenir shopping). 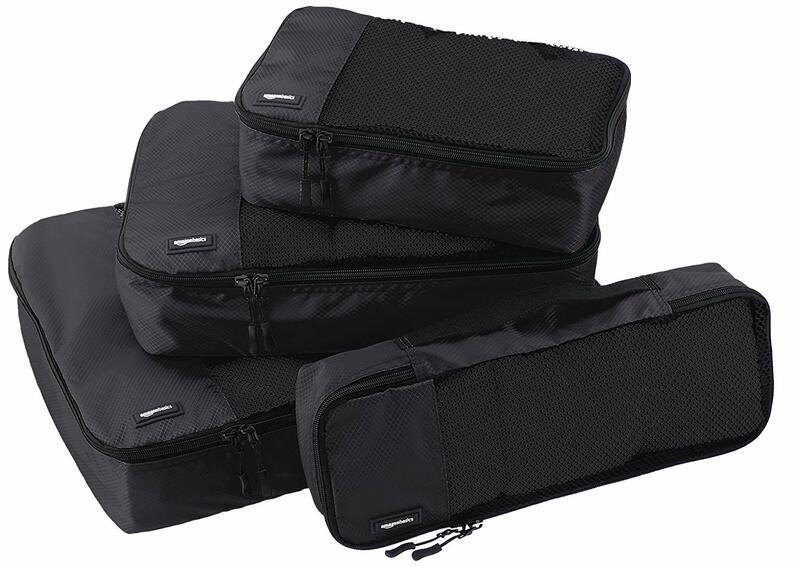 Packing cubes are deemed the ultimate packing organizers. They allows you to maximize the space in your bag, even squeezing in none practical items such as bulky coats and leather items. They can also be used to store electronics and other fiddly bits such as power chords and cables. Similar products, such as underwear/ t’s/dirty laundry, can be packed together, meaning they can be easily found without much rummaging. Planning a trek? The cubes are great for taking on day trips during your travels. Ideally, for storing items such as scarves, socks and sleeping liners, they are also perfect for long flights or travel journeys, giving your easy access to comfort items such as clothing layers, travel pillows and blankets. The packing cubes can even be used when you’re back home. It allows you to neatly store clothes, maximizing small storage space – beneficial (if you’re like me) and your room is slightly size challenged. TFG’s favorite are these packing cubes from Compass Rose. They’re our own brand! It holds 12 – 15 large clothing items, allowing you to fold and store bulkier items in a larger bag, freeing up valuable luggage space for other essentials. These organizers feature instructions depicting the best folding methods for your items and a Velcro closure that keeps the clothing neatly folded and wrinkle free. 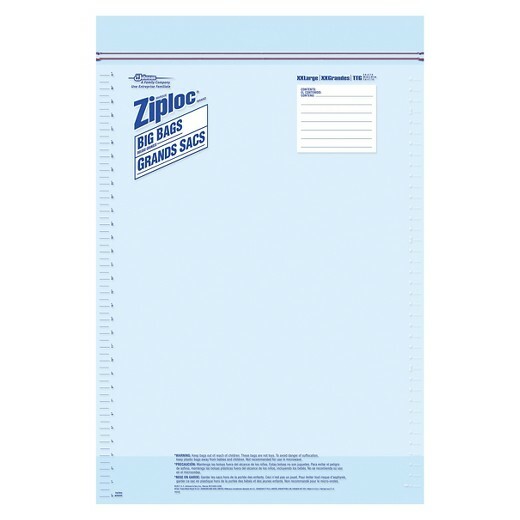 Travel packing folders are designed to maximize space and minimize wrinkles. It means they are a very popular option among business travelers. They are available in an array of sizes storing around 7 – 15 items (perfect for shirts and trousers that tend to crease easily) and fit perfectly into most carry on size luggage. A packing folder is perfect if you dislike rolling your clothing. 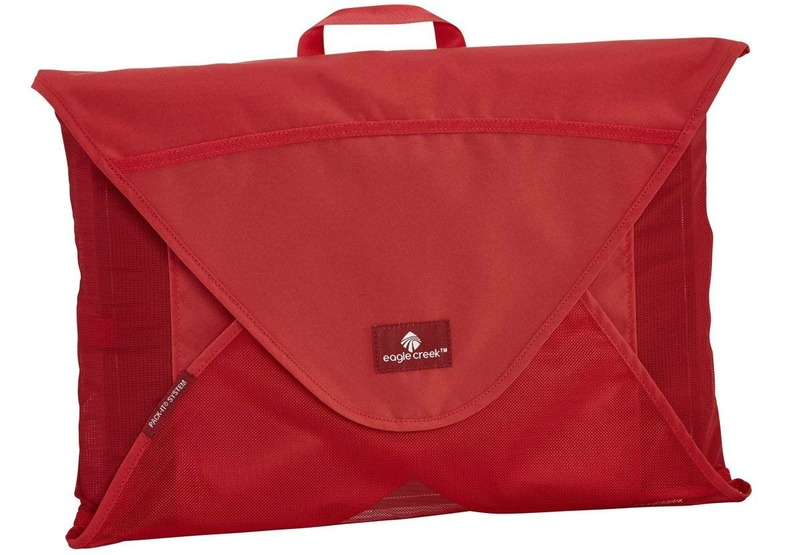 Simply use the board to assist with folding garments then store them flat within the packing folder, creating organization and structure within any bag, simple! Take a spare packing folder to space to store your dirty laundry. It’s definitely more efficient than stuffing it into a laundry bag as it maximizes room in the luggage ensuring that the unlaundered clothing remains separate from your clean items. 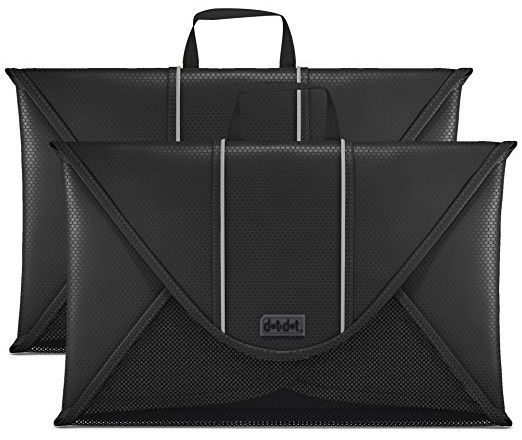 The Dot&Dot Packing Folder, is a popular packing organizer with travelers and designed to fit in a carry-on size bag. Compression sacks are the perfect packing organizers for travelers who need to pack bulky, trekking, and activity-based clothing items. You simply stuff your clothes into the sack and compress, creating an easy, space efficient and flat packing aid. Compression sacks can be useful when packing with a top loading backpack. 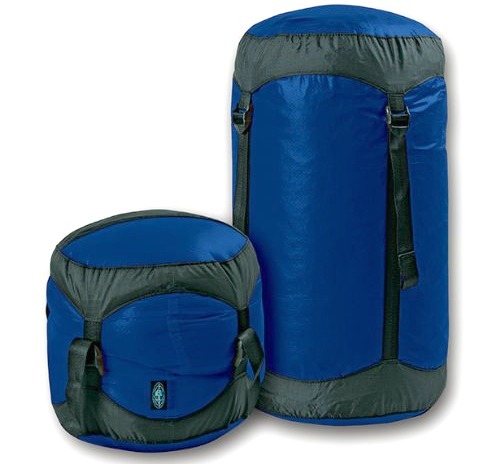 Check out the Sea to Summit Compression Sacks for light and durable packing aids. Planning a hike? The compression sack is great for compressing bulky items. 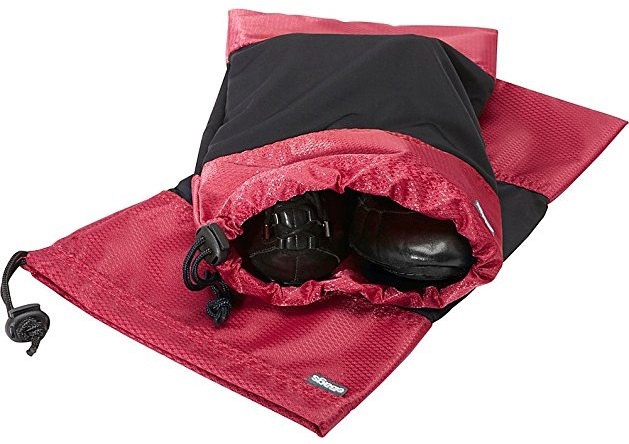 Such as sleeping bags and camping gear, there are also waterproof versions available for water sport enthusiasts. The bags are great for use at home, too, for storing out of season clothing efficiently and effectively until next year’s use. Check out TFG’s guide on how to choose a travel backpack. We all know packing can be frustrating, so we want to make the process as easy and stress free as possible. Below are some additional space-saving products to ensure your luggage is packed as efficiently as possible. The Pack-it-Flat Toiletry kit from eBags is the ideal savior product for all those times you’ve packed your luggage, only to discover that you didn’t leave enough room for your toiletry products. At only 2-1/4” thick, the Pack-it-Flat kit has the same ease of packing another pair of jeans, simple! It features four compartments to keep your essentials organized, an expansion zipper for packing flexibility and a removable hanging hook for versatile storage. For more styles, check out TFG’s Top Toiletry Bags for Travel. 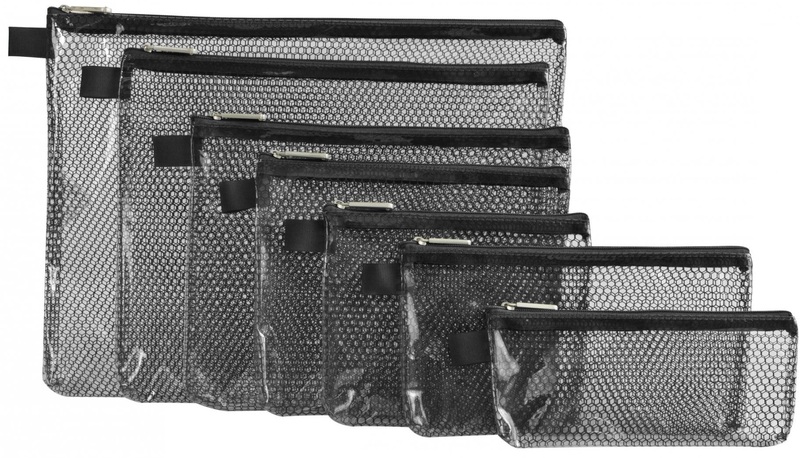 The sturdy PVC mesh set of packing organizers come in a variety of sizes providing storage for your toiletries, charger cables, cosmetics and other travel necessities, and features transparency providing easy viewing of its contents, a water resistant, easy clean design and zip closure to ensure contents remain secure. The unisex shoe sleeves are designed to fit both women’s and men’s shoes, comfortably fitting up to a size 13. The pouches protect both shoes and clothing from dirt and debris and their stretchy, soft design allows you to fit your shoes easily and snugly into small packing spaces, bonus! 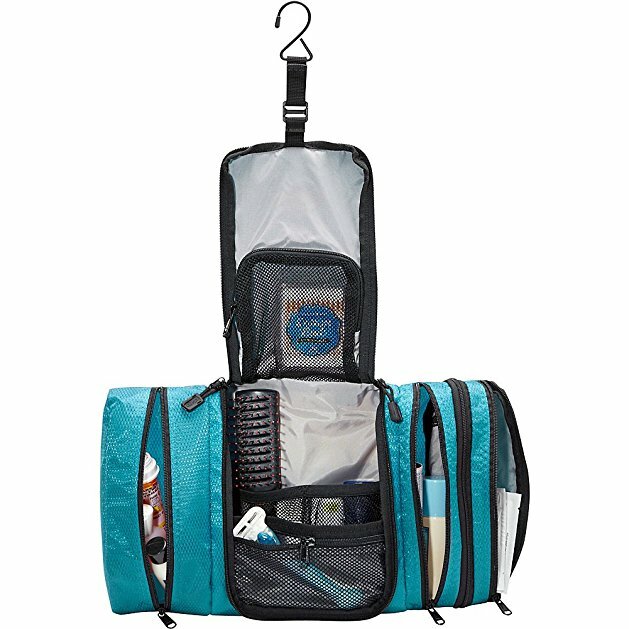 These packing organizers from AmazonBasics makes a great choice when packing for business trips, summer vacations, or out-of-town family holidays–or for dorm rooms or simply heading to the gym. The slim toiletry kit offers ample space like with a large-size dopp kit, yet it folds flat, taking up about the same amount of space as a pair of jeans, perfect for space-saving placement in any suitcase or travel bag. 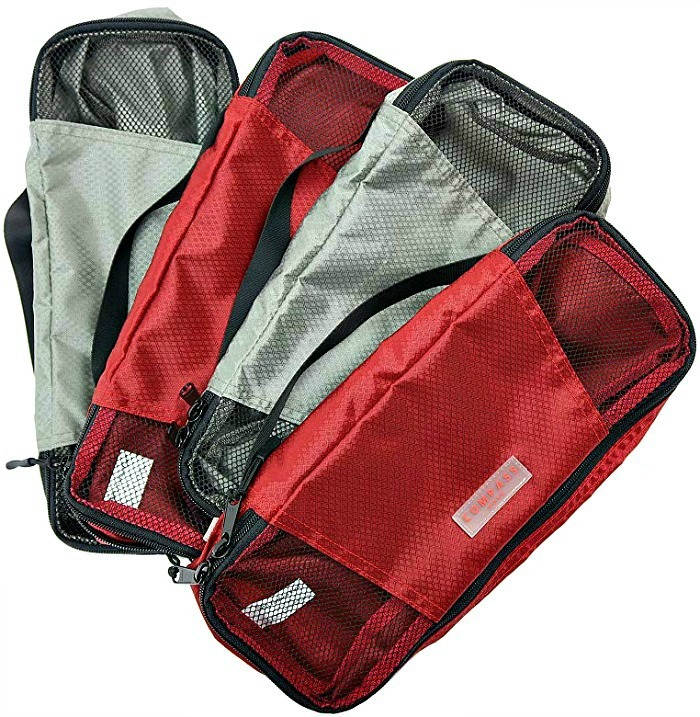 The solution for backpackers and travelers that are constantly on the go are toiletry bags with a hook! Check out our best hanging toiletry bags! These are the basic bags you use at home to store food or other items, but they still count as packing organizers! Many travelers prefer to use Ziploc bags because they’re cheap, clear, and you probably already have some at home. Traveling without Ziploc bags is like traveling without your passport, it just can’t be done. Storing items in the clear bags ensures your suitcase remains organized; the transparency means products can be easily found without the need to up turn your entire luggage. Protect your camera: A great way of protecting your precious travel camera in the rain. Document holder: Keep your passport/ travel money/travel insurance safe and sound all together in one place, no more rummaging in the depth of your bag. Jewelry pouch: Lost an earring? Store all your jewelry together in a sealable bag; it’ll save your favorite pieces from becoming lost. Cables store: The best way to store all your cables and chargers – stopping them from becoming tangled. Swimsuit bag: A great way of transporting your wet swimwear/towel from the beach back to the hotel. Alternatively, we also love these dry bags. Airport inspection bag: The easiest way of displaying your liquids for inspection at the airport, store in the front pocket of your luggage for easy access. Liquids storage: Who doesn’t hate a burst shampoo leaking all over their freshly packed luggage? Double bag your products in Ziploc bags to ensure you avoid the nightmare. Travel Tip: Avoid using these bags if you’re planning to stay in a hostel. Don’t be that person crunching plastic when others are trying to sleep. Find out other hostel essentials and tips! 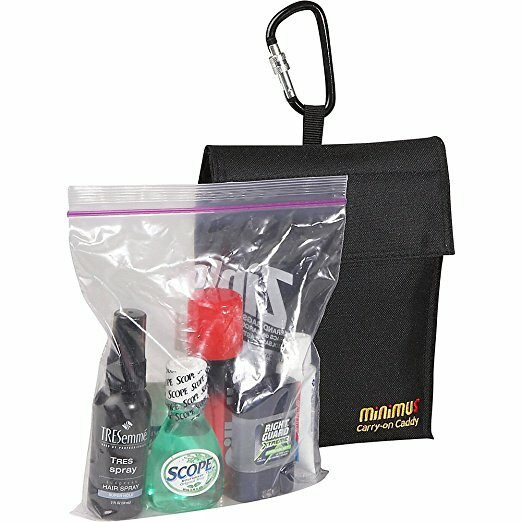 This clip-on (easily attachable to your travel bag or carry on) caddy pouch from Minimus allows you to take your most important grooming products through airport security with ease. The interior re-sealable Ziploc bag features essential travel sized products such as toothpaste, mouthwash, deodorant, hairspray, lotion and shaving cream. 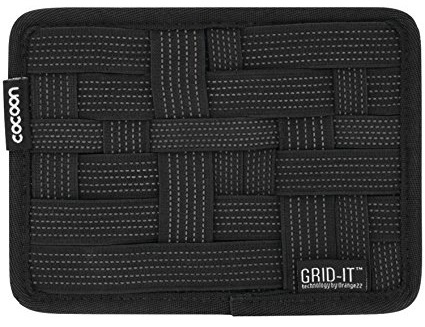 The perfect packing organizer to keep all your small necessities such as cosmetics/electronics/phone/iPod etc. together and perfectly organized, freeing up valuable space in your luggage. This unique packing aid features loops, pockets, and pouches to store all your essential accessories making it the perfect organizer for the gadget aficionado. 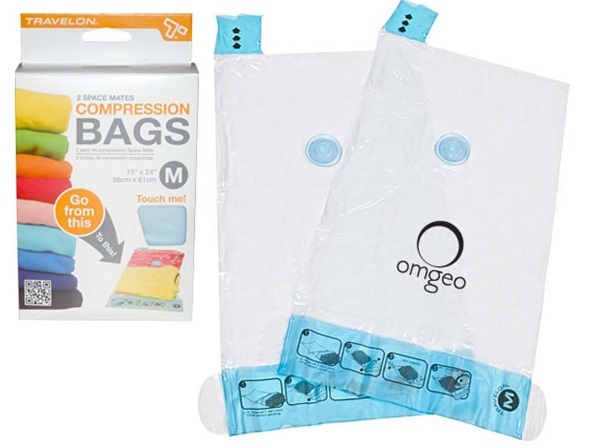 This space-saver includes a reusable medium and large sack featuring an easy seal closure, the ability to be compressed without the need of a vacuum cleaner, an airtight and leak proof design. The bags are great for making the most room out of the least space! Which of these packing organizers will you choose to organize your clothing? Alternate Uses for Packing Cubes – Organize your Closet Space! I hope you found these tips on how to choose packing organizers helpful. Please share with your friends on Facebook, Twitter and Pinterest. Thanks for reading! What is the best packing cube/system for bras/underwear? 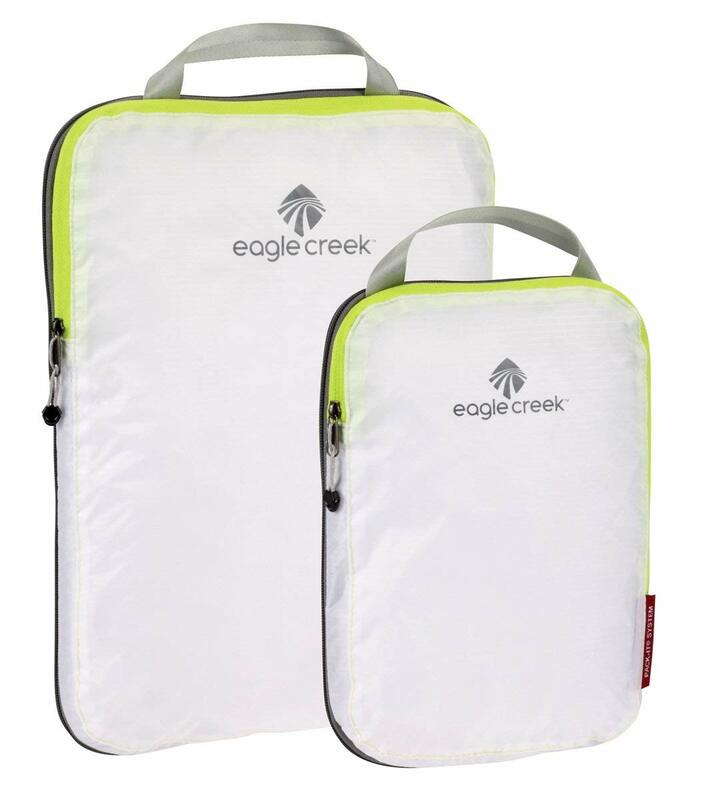 My favorite is the Eagle Creek compression packing cubes. Expensive yet so handy! 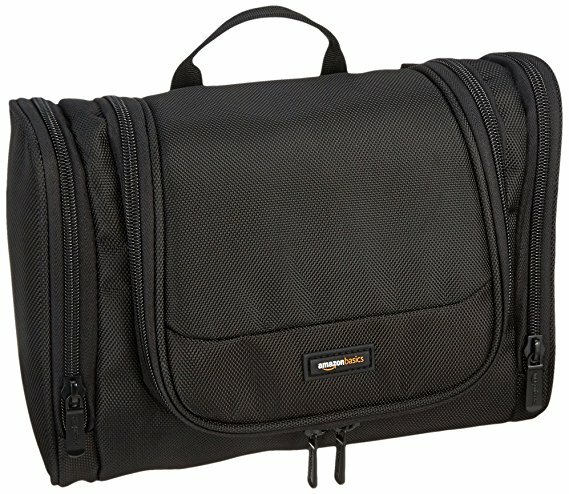 I’ve used the ebags brand and while they’re great, I don’t like the frame. The eagle creek ones I can at least compress down and squish to maximize even more space in my bag. I used to just use the packing cubes when I fly, but now I use them on weekend and overnight trips. It helps organize so I have “drawers” in a sense, in my suitcase and not rifling through my whole clothes in my suitcase. Who travels without packing cubes anymore? I mean besides my husband who stubbornly refuses to use them. We never take anything bigger than a carryon, no matter how long were going for. I have several sets in different colors so it’s easier to find the cube I want. Awesome!! Yes, I love packing cubes so much! They are so helpful! Thanks for reading Sharon! Thank You for the info! Ive just ordered my first set of packing cubes! Woo! Love this! I hope you like them Emma 🙂 I swear by them! Great article, thank you! For a recent trip to Germany and Switzerland in the summertime (though we had to pack warm clothes for a trip to Zermatt), I SWEAR by the rolling method and then compression bags. I bought mine at REI. I had one for tops, one for bottoms, one for undergarments and one for scarves. When I arrived, I lifted out the four bags and could easily drop them into hotel drawers (if staying for a few days) or put them around my bag if staying for longer. I agree that ziplocs are great for seeing things and keeping items together. Any tips on charger cords. They are my NEMESIS. I use hair claws to keep cables and cords in order. will check them out. thanks! So how do you deal with all the wrinkled cloths when you get settled. That’s great to hear! Congrats! 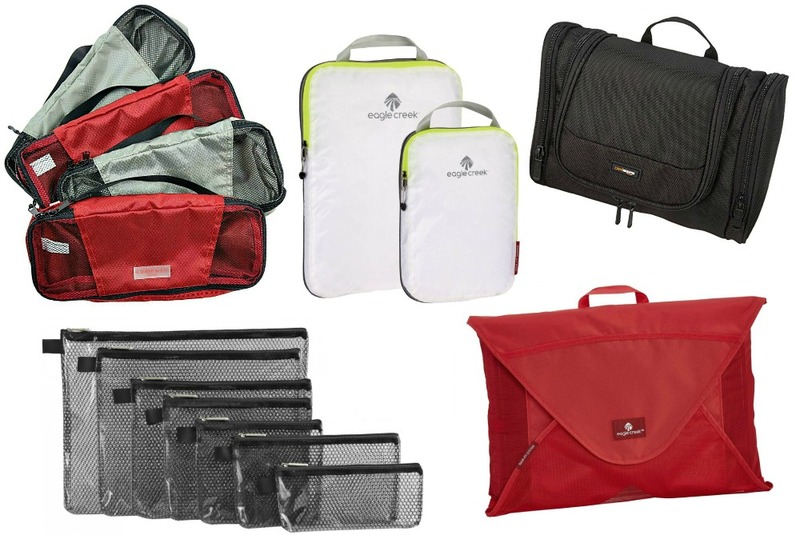 I have the ebags packing cubes (both slim and regular S,M,L size) and I LOVE them! I use them every time I travel now. If I am checking a bag, the M and L size go in that bag (along with anything else bulky, like big shoes etc) and the slim cubes and S size cube go in the carry on. Would never travel without them now! I also use compression bags sometimes if I need to pack thick things like winter coat, etc. Are Ziplocs not the most versatile packing accessory ever? I use them for so many different things & always bring a few extra just in case! I love packing cubes, I use them every trip. They are great!